Get a $5 Starbucks gift card! See how you can perform thorough continuity testing, DC resistance measurement for safe operation/reliability, E-Marker verification, and signal integrity testing with the Advanced Cable Tester. Get a Starbucks Gift Card! Fall has officially arrived, which means pumpkin is taking over...even here at Total Phase! We're ready to get the fall season started with our favorite seasonal beverages (pumpkin spice, anyone?). For a limited time, you can receive a $5 Starbucks eGift Card with your purchase of a Promira Serial Platform. Simply use the promo code: PumpkinSpice at checkout to redeem this offer. You will receive a Starbucks eGift Card in your email (email address used for the order) within a week. If you'd like the eGift Card to be sent to someone else, please specify their email in the notes upon checkout. Offer limited to Promira Serial Platform hardware only. This does not include Promira applications. Limit one gift card per Promira Serial Platform. Offer is only available in the United States. This offer is only available to end-customers. Resellers/distributors are not eligible. Total Phase reserves the right to cancel or modify this program without notice. 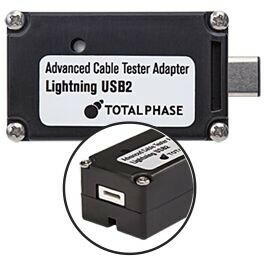 The Advanced Cable Tester is an essential tool for cable manufactures and sellers; it provides unsurpassed, complete and comprehensive testing of USB Type-C cables to ensure they are safe to use and pass the respective cable standards. Expensive scopes and highly trained personnel are a thing of the past -– This easy-to-use tester can be used and verified by almost anyone at a fraction of the cost. As a special introductory offer, we are giving customers 2 free Standard-A adapters with the purchase of 1 Lightning adapter. Simply use the code: LIGHTNING at checkout. Find out complete details on this product here. Note: In order to purchase this product you must be a member of the Apple MFI Program and you will be required to provide your membership number before the order will be processed. Total Phase has released a new firmware update for the Promira Serial Platform. This new firmware, v2018-09-14, contains updates for the Advanced Cable Tester, which provides enhanced speeds and adds the USB-A to Lightning cable test. We encourage users of the Promira Serial Platform and/or the Advanced Cable Tester to download this new firmware as it ensures your devices are running optimally and have the latest support for Lightning. For instructions on how to complete the upgrade, please refer here. I've worked with the Aardvark for years and recently purchased the Promira Serial Platform to work at faster speeds. Works great for SPI! © 2018 Total Phase, Inc. All rights reserved.